The model 990.51 diaphragm seal with aseptic connection per DIN 11864 is ideally suited to fulfil the high standard requirements of sanitary applications. It can be optimally integrated into aseptic processes, fulfils all hygienic design requirements and is EHEDG certified. 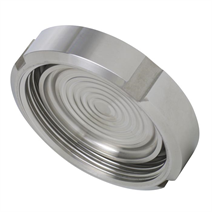 The diaphragm seal systems can withstand the cleaning vapour temperatures occurring in the SIP processes and thus ensure a sterile connection between the medium to be measured and the diaphragm seal. Measuring systems with the model 990.51 WIKA diaphragm seal are successfully used in pharmaceutical, biotechnology, aseptic food production and life science industries.